TheGardenLady received this question from Julia. How do I prepare my KNOCK-OUT Roses for winter? KNOCK-OUT Roses were bred to be almost maintenance free. So, if you live in zone 5 or a warmer climate, winter maintenance is minimal. That being said, mulch the roses with leaves or hard wood AFTER the first hard frost – you want the ground to be frozen solid. * If you want, you can burlap the rose plant. Burlaping will also prevent the deer from eating the rose bushes. If the roses are in pots, the pots should either be buried in the ground or brought into the garage. The pot does not give adequate protection to the roots during the cold, freezing winter. TheGardenLady has mulched her KNOCK-OUT roses but never burlaped them and they were glorious with their profusion of flowers all summer long. A great book to read on care of roses is: A Year of Roses by Stephen Scanniello. This book tells you everything you want to know about raising roses and tells you what to do to care for roses each month of the year. I’ve seen quite a few people around here with Knock-out roses;they are beautiful. I want them and needed to know when to plant them. You gave great information on caring for knockout roses, but I’m still not sure when to plant. I planted eight knock out roses in the sun last year and they bloomed. After blooming the first year I put mulch on the base of the rose bush and the ground was not frozen. This spring I cut them back slightly the first bloom was great. We went on vacation and had a bad rain storm and the roses stopped. What am I doing wrong. We planted a knock-out rose bush this past spring. It started blooming and had beautiful roses. We noticed that the stems were cut. The deer are eating them. What can we do? My knockout roses were being eaten by rabbits. I “caged” them with fencing – green – so it didn’t detract from the landscape. My cages were about 18″ high. The roses were new, so they weren’t near the height of the cages. They thrived after I caged them! 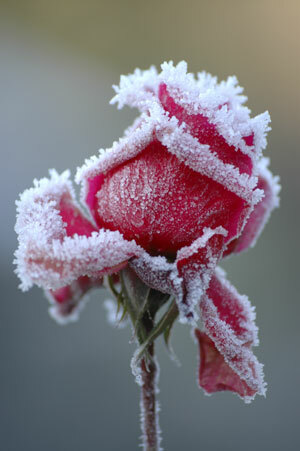 The picture of that rose covered in frost is breathtaking! I hope this is ok. I loved your photo of the frozen rose, and my son did a science fair project on freezing roses to see if they would stay alive. He used your photo on the cover of his project notebook. Is that ok with you? I live in Southern, MA. My knockout roses became overgrown this year so I cut them way back today, do I need to protect them since they are cut down to about 1 ft high? Hello, we live in South Carolina, the temeture here gets cold at night sometimes in the low 30’s, but warms up fast when the sun comes up to 60 degrees or better during the winter months, we planted knockout rose bushes, they are at least 3-4 feet tall, do we need to cut them back during the winter months or is it ok to leave them? we’d rather leave them since were still getting roses on them, but want an expert’s advice, it stats to warm up the end of february at night here. please let me know. thanks for your time & help. See the Knockout Rose website: http://www.knockoutrosesonline.com for detailed care and video instructions. Hardiness Temperature Zones: What Zone Will Make My Plant Happy?